One early Monday morning last October, the clinical team at the Western College of Veterinary Medicine’s (WCVM) Veterinary Medical Centre (VMC) was preparing for rounds when an emergency patient was brought in to the hospital. Granny, a wirehaired pointing griffon-cross dog, was lethargic, her gums were pale and her heart rate was elevated. The hospital’s emergency and critical care team immediately started the 11-year-old dog on intravenous fluids before turning to the challenge of diagnosing the problem. Granny’s owner noted that her dog’s abdomen was sensitive, and after an ultrasound examination, the clinical team found that a twisted spleen was causing the pain and internal bleeding. Once Granny received a blood transfusion and her condition was stable, surgical specialists successfully removed her spleen. Granny, who quickly recovered after surgery, was one of thousands of patients that the WCVM’s small animal emergency and critical care team cared for in 2018—nearly 500 emergency cases in October alone. 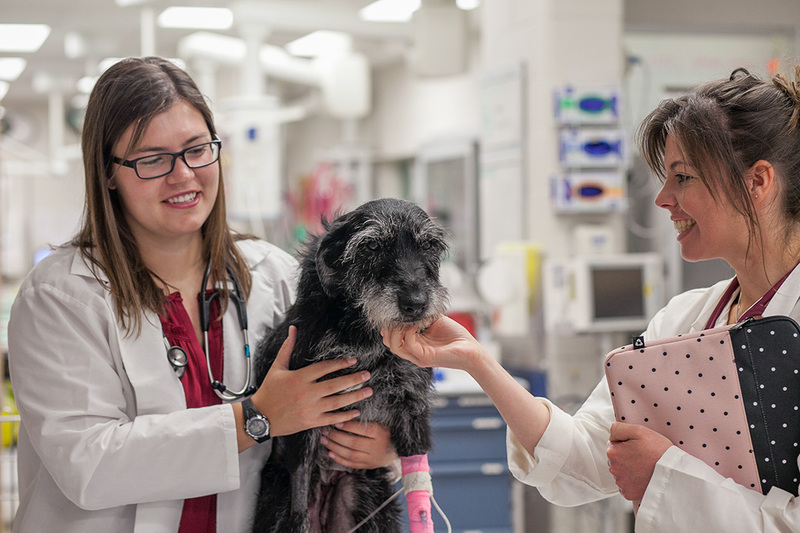 The hospital’s small animal emergency and intensive care unit (ICU) is an incredibly busy spot that’s open 24 hours a day, 365 days a year, on the University of Saskatchewan campus. The WCVM’s Large Animal Clinic and Field Service also offers around-the-clock emergency services for horses and other large animals. “It doesn’t matter what time of day it is or what your work schedule is, if you have an emergency with your pet, you can take it to the vet college because somebody is here,” said Danielle Mierau, a registered veterinary technologist (RVT) and one of 21 people on the WCVM’s emergency and critical care team. “We have four teams of four RVTs in the intensive care unit, we have three emergency clinical associates [veterinarians], and one emergency and critical specialist,” said Mierau, who is also a certified veterinary technician specialist in emergency and critical care—one of four RVTs with specialized training working in Saskatchewan. When a patient is brought to the Small Animal Clinic, an RVT assesses the pet’s condition. Team members act quickly when an ill patient is brought into the emergency and ICU area. “If it’s a critical case, the clinician stays with the RVT and the patient, then if we need to get specialists involved from there, we do that,” said Mierau. One of those specialists is Dr. Jennifer Loewen (DVM), who joined the WCVM in October. She is Saskatchewan’s only board-certified specialist in veterinary emergency and critical care. Loewen, who graduated from WCVM in 2014, also assists in training fourth-year veterinary students who are completing clinical rotations in the hospital. Since the VMC is the veterinary referral centre for Western Canada, the hospital’s emergency patients come from Saskatchewan, Alberta, British Columbia, Manitoba and even Ontario. Many of these cases are referred to the WCVM by veterinarians who graduated from the college. “Exposing students to [clinical services] that are available here at the college helps to create future referring veterinarians because we have the expertise that their patients sometimes need,” said Mierau. As for Granny, she returned home after a short stay in the college’s ICU.